“Still Walking” is an important film in the career of now Palme d’Or winning director Hirokazu Koreeda. One of his strongest films to date and something of a tribute to the works of Yasujiro Ozu, his attention to detail is most evident here, finding the pace that he would find comfort with for his now established brand of cinema. But, as important, it was also the first collaboration between him and the late Kirin Kiki, whom he would work with on a total of six films over the next decade, helping establish her as Japan’s cinematic grandmother. On the anniversary of his death, Junpei’s family gather for their annual memorial. The eldest son, an aspiring doctor following in his father’s footsteps, coupled with the fact that he died saving a young boy’s life, paint the image of the ideal man. Fifteen years on, the remainder of the family still gather once a year to remember him. Ryota (Hiroshi Abe), the other son, a struggling art restorer, now married to a widow and her son; Chinami (YOU), the only daughter, with her bumbling husband and two out-of-control children; and the parents, the now ageing Kyohei (Yoshio Harada) and Toshiko (Kirin Kiki). Set over the course of the summer’s day and the following morning, the family now show their distance; the gathering highlighting the various disappointments and frustrations the family have with one another. As such, there is little plot to speak of, but more an examination of the various dynamics within the family. Ryota is the central figure for Koreeda. Failing to become a doctor like his father and older brother, Kyohei’s frustrations with him are clear; the two keeping conversation minimal. His sister also views him as something of a sponge with little financial success or future; his mother loving him as only a mother can. His parents are also less than tactful towards their new daughter-in-law: Kyohei commenting it better that Junpei didn’t have any children -his widow easier to remarry-off without a child. Yukari’s (Yui Natsukawa) claims that she did alright for herself with Ryota fall on deaf ears. But Chinami too is a disappointment: Kyohei can’t abide his son-in-law, Nobuo (Kazuya Takahashi) and Toshiko is damned if she’s to allow Chinami’s wishes to move into the home to come true, with those kids. This is no longer a house of love, but more a breakdown of the family unit. Distant, they each keep secrets from each other: Ryota creative with how successful his career is; and Chinami’s designs on the family unit. Junpei’s absence is this breakdown: without him there is something missing from the family unit. Toshiko’s insistence that the cause of this demise , the boy who Junpei saved, now an overweight, bumbling loss of a man, chillingly reveals her pain; for one day a year, he can be made to feel as bad as she does. A butterfly flying in she wants to believe is Junpei shows just how much she wants him there rather than the other children she has to put up with. The attention to detail within the script is one of Koreeda’s strongest works, with the depth of character exploration and the dynamics of how each interact with the others gives realism and layering. Unlike Junpei, these are real people with flaws-not an ideal image. As would become a staple in Koreeda’s subsequent films, his exploration of frustrations and the duration it can take for realisation and resolution is worked to perfection. Life has no easy answers. A fine progression in writing from his earlier works, where the conclusions can feel somewhat abrupt and blundered. The realism within the characters makes the themes here universal, unlike the more unconventional family scenarios of subsequent films, such as “Like Father, Like Son” and “Our Little Sister”. Everyone can see something of their own family life in such a gathering: fighting for attention and against irritation. The use of the Ozu-esque cross-section shots of the household makes us feel like a theater audience watching in. 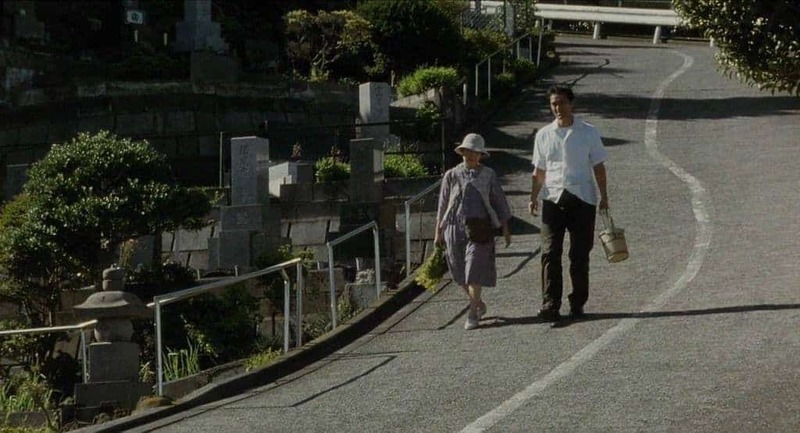 So strong was it, that perhaps “After the Storm” was an Ozu-esque self-remake, reprising the Kirin Kiki-Hiroshi Abe mother-son relationship; the latter part a similarly-paced overnight gathering at grandma’s where family relations are strained. Kirin Kiki’s performance here shows why Koreeda chose to work with her regularly after. The breeze with which she acts out the household tasks, the flow of her interactions with the rest of the family and the cold bluntness of her treatment of others are all exceptional. A standout in a collection of strong performances. Much like Junpei’s absence, with “Shoplifters” seeing him reach his critical peak, perhaps Koreeda’s films from here on, may be lacking a certain something.